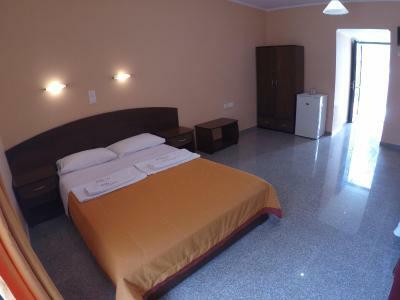 Lock in a great price for Kalias Hotel – rated 9.1 by recent guests! The pool was bigger than I supposed. The breakfast was exceptional - fresh, lot of different types of food, tasty. The big maple tree is very beautiful. Everything about the facility, especially the breakfast.... Delicious! Very pleasant owners. 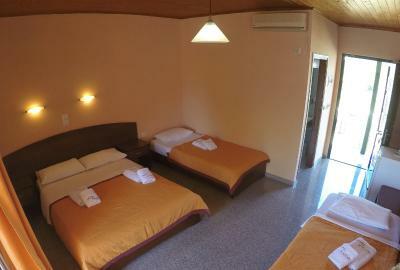 Rooms were great, very comfortable. The location was great. 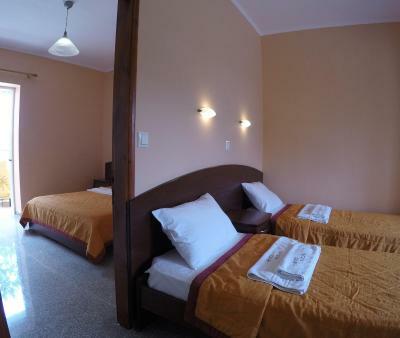 Walking distance to the beach, restaurants, stores. One block to beach. The breakfast was very good,many choices. The room was spacious. Spacious and clean room. The beach is just across the street. The pool is also nice. There are a lot of options for watersports in the area. Great breakfast buffet including freshly-made local delicacies, super kind and helpful staff and owner, a stone's throw from the beach. Great for families with small children too, there is a kids pool too and a nice garden with hammocks. 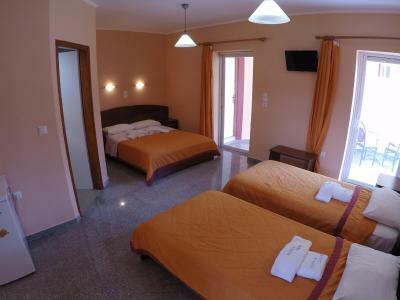 Kalias Hotel is perfect place for one wonderful vacation. Me and my boyfriend were extremely happy with our stay in Kalias Hotel. Spyros and Svetlana are really friendly and welcoming hosts. They made us feel like home. The breakfast is really delicious and is like homemade. We had new fresh towels every day and a cleaning of the bathroom also which was just great. There is free parking and wonderful pool. 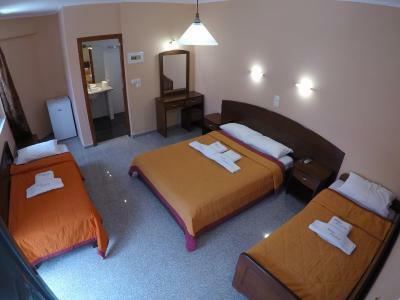 The rooms are big enough and extremely comfortable. We had a really nice terrace.The location is more than great - not more than 10 minutes from the centre of Vasiliki which is perfect for a nice sleep without noise. There is a supernarket 300 m from the hotel and some tavernas and bars if 10 minutes are too much for someone to go to the centre. We really enjoyed our stay and would recommend the hotel to our friends and all users of booking. Accomodating and friendly staff. Included a large selection of breakfast items. 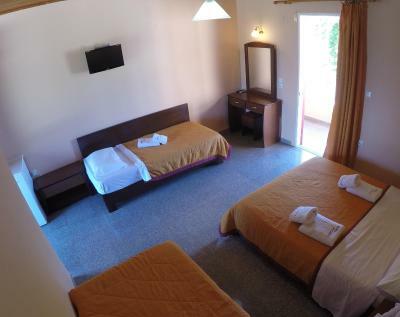 Kalias Hotel This rating is a reflection of how the property compares to the industry standard when it comes to price, facilities and services available. It's based on a self-evaluation by the property. Use this rating to help choose your stay! 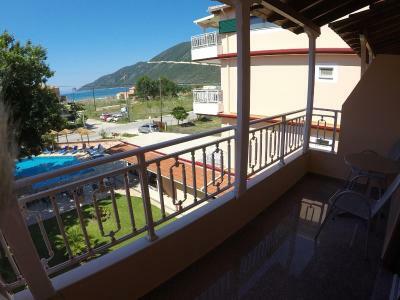 Featuring an outdoor pool, Kalias Hotel is only 500 feet from Vassiliki Beach with watersports. Set amid a well-tended garden, it offers a poolside snack bar and free Wi-Fi. A children’s pool and playground are provided for younger guests. Enjoying Ionian Sea and pool views from their balcony, all rooms and suites are fitted with dark wood furnishings and granite floors. 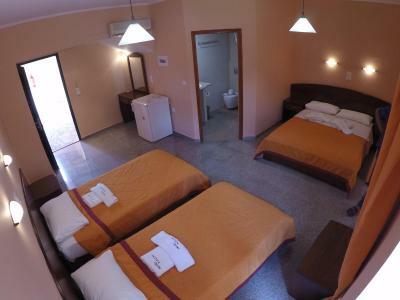 Each includes air conditioning, a flat-screen TV or a TV with satellite channels and mini fridge. Free toiletries and a hairdryer are provided in the bathroom. A bus stop is located just in front of Kalias Hotel. Guests can find a mini market and taverns at 1,650 feet from the property. Nydri Port is 12 mi and the main town of Lefkada is 24 mi away. Free parking is possible on site. 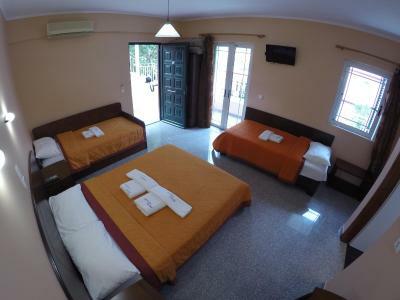 When would you like to stay at Kalias Hotel? 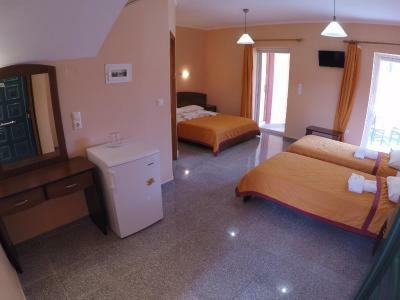 Offering Ionian Sea views, this air-conditioned room opens to a furnished balcony and a patio. 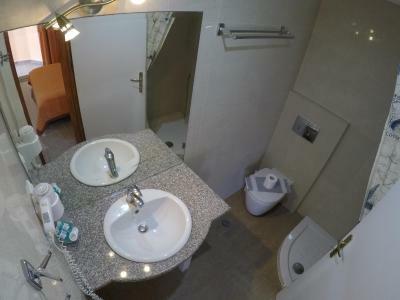 It features a flat-screen TV and a mini fridge. Free toiletries and a hairdryer are included. Free WiFi is available. 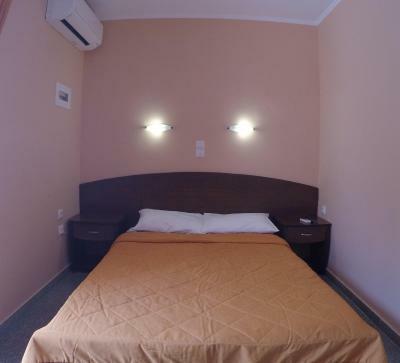 Please note that this room type may accommodate an extra bed (see hotel policies). This air-conditioned room offers sea views from its balcony or terrace. It has a flat-screen, satellite TV and a mini fridge. Free WiFi is available. House Rules Kalias Hotel takes special requests – add in the next step! Kalias Hotel accepts these cards and reserves the right to temporarily hold an amount prior to arrival. 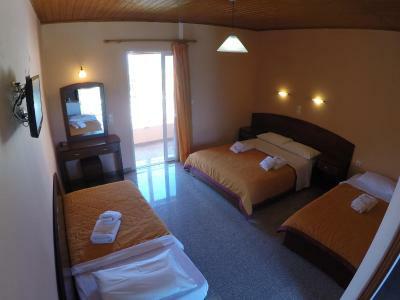 The hotel was in an excellent location just a couple of minutes drive from Vassiliki. Breakfast was superb and the roomswere always tidy and clean ! 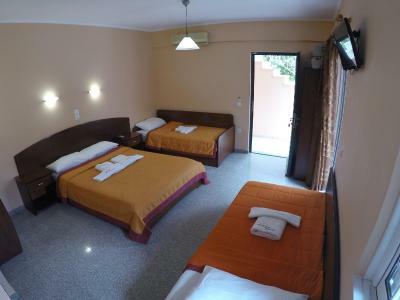 Nice hotel, comfortable bed, free parking. The attitude of the owners towards the customers is felt. Excellent breakfast prepared personally by them. Very good location. 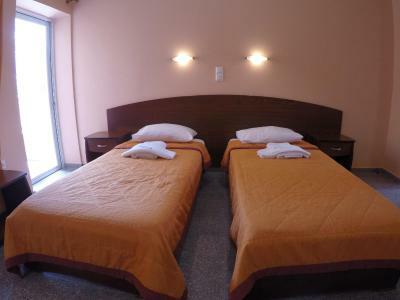 Very clean in the rooms and daily change of bed linen and towels. The breakfast was very good, the food was various. 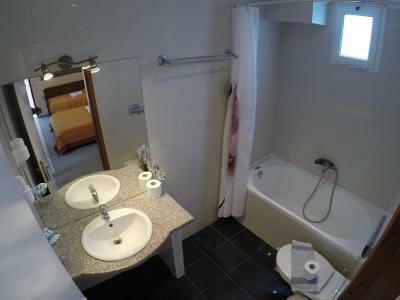 The rooms were cleaned and the towels were changed every day. We enjoyed our stay, we will gladly return there. The location (next to the beach), the very friendly owners, the breakfast (tasty and a very good variety of products). Highly recommend it! The power sockets should be near the bed. The TV was turning on by itself during the night so we had to unplug it. The bed is not very comfortable (they should invest in softer mattresses). We also had mosquitoes that bothered us. The owners (Spyros or Svetlana) are always there to help you, if you need anything. 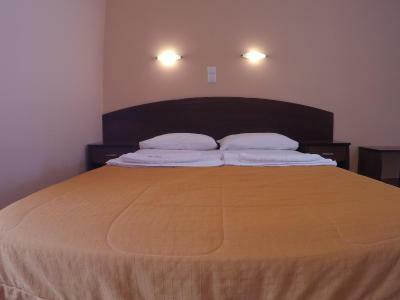 Breakfast is great, hotel is very close to beach and restaurants, supermarkets. 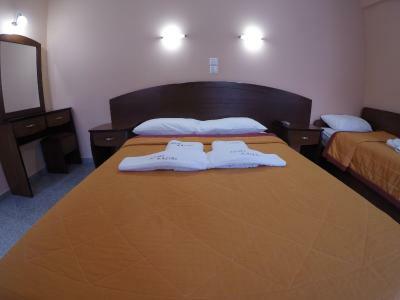 Rooms are cleaned every day, towels are changed daily. Excellent value for money! The hotel has everything you need. Everyday they clean the rooms and the hosts make an amazing breakfast. In the evening I decided not to eat so i could have more of the breakfast. Everthing is home made. Perfect experince, great food, great staff, great location. I will definety recoment this place to frineds. Again i want to mention that the breakfast was extraordinary. Great place to stay. Spyro and his wife Svetlana are kind to you in every way. Great breakfast. 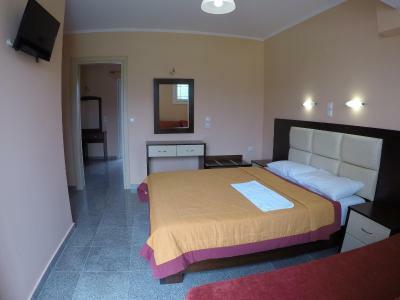 Daily cleaning of the rooms with high quality. Perfect access to a beach appropriate for kids. 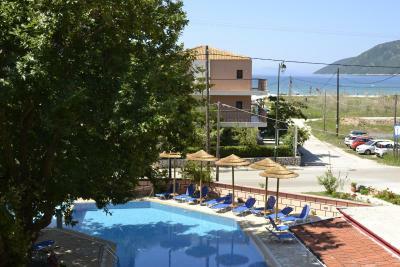 Looking forward to visit Kalias hotel and Lefkada next season. First of alla the owners,Mr. Spyros and Mrs.Svetlana are great people..always with a smile and always there to answer any kind of questions,to quide people and provide any help needed. These people love their job and most important they care and they show it! 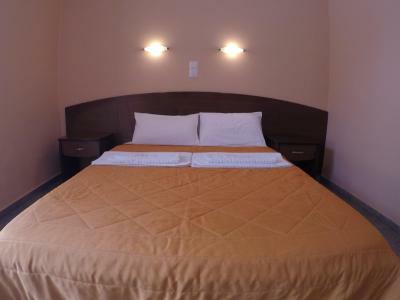 The hotel is very clean, with excellent facilities and great breakfast. Definately we will visit again!! 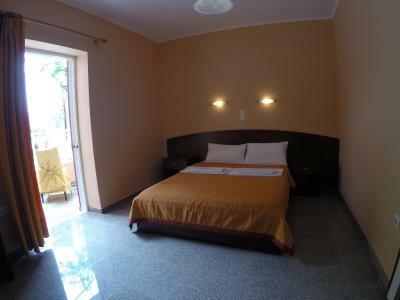 Very clean , great hosts, perfect localization, nice pool and only 2 min walk to the beach. I strongly recommend this hotel. Easiest check in and check out in my history... it all took maybe 30 seconds! !